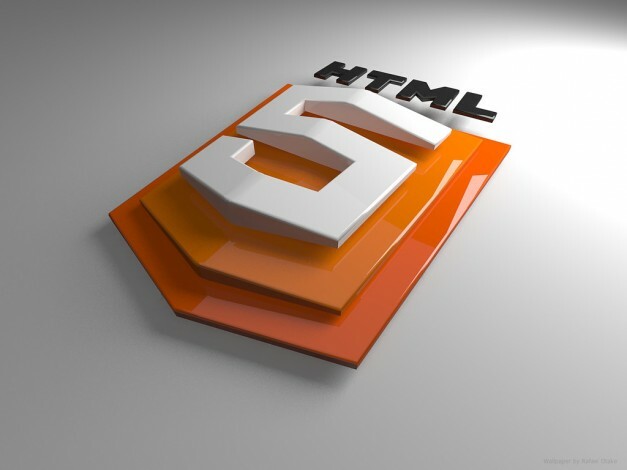 HTML5 is a text-based markup language for structuring and semantic markup of content, such as text, images and hyperlinks in documents. The language is currently still in development, but there are already quite sophisticated designs. The language replaces the document description standards like HTML 4.01 XHTML 1.0 and HTML DOM Level 2. It offers many new features such as video, audio, local storage and dynamic 2D and 3D graphics that are not directly supported by HTML4 and without additional plug-ins – such as Adobe Flash. Following the release of HTML 4.0 specification in December 1997, except for the version 4.01 in December 1999, which contains only bug fixes, up to April 2009, there were no more updates to the markup language. The World Wide Web Consortium (W3C) started to work on XML , which would become the successor to HTML, and HTML 4.01 reformulated to the XML-based markup language XHTML 1.0. Here, the functionality of HTML 4.01 remained without changes. Then, the W3C began development of XHTML 1.1 and later, XHTML 2.0, which no longer used had much in common with HTML 4.01 and wanted to do much better than HTML. This led to XHTML 1.1 and XHTML 2.0 which were no longer backwards compatible with these new developments. In addition, the creation of XHTML 2.0 documents was in many respects very heavy in comparison to HTML and required a lot of background knowledge. The development of CSS was also at this time very slowly so that the W3C faced more and more criticism. To counter these developments, publications, founded by several browser vendors Web Hypertext Application Technology Working Group center (WHATWG) in 2004 under the name Web Applications 1.0 the first gave the proposal for HTML5. In mid-2009, W3C announced that the development of XHTML 2.0 will be discontinued by the end of the same year. The next generation of markup languages ? ?for the web is that not a new variant of XHTML, but HTML5. The aim of the W3C HTML Working Group is, however, to publish a stable snapshot of this specification under the name of HTML5. To a predefined procedure is run until the specification finally to a W3C Recommendation. W3C expects that the full HTML5 specification will be supported broadly by the year 2014 and thus published as Recommendation. WHATWG follows a loose version of the development model. They are working on a so-called living standard, i.e. a specification that is subject to constant correction and expansion. Therefore, the WHATWG waived the version number “5” and only talks about the “HTML standard”. The author of the specification Ian Hickson , founder of the WHATWG and employee of Google . Different specifications are generated from the raw text edited by him, both on the part of the WHATWG and the W3C counterparts . The WHATWG HTML specification integrated several related specifications, which are divided by the W3C in individual documents. These standards are separate Microdata metadata, the 2D drawing context of the canvas element and cross-document messaging (HTML5 Web Messaging). The first important goals for HTML5 were re-inventing HTML by Tim Berners-Lee in his blog entry “Reinventing HTML” in the development are primarily the groups to be involved in the use HTML (Web authors, producers browsers). This HTML must be incremental, are therefore developed through revision and extension of the previous version, and the transition to well-formed documents. The development of forms in HTML will be extended towards the ideal case a step from the existing form structure XForms form. In the wake of the establishment of the new HTML working group and as part of the architectural vision for HTML, XHTML and XForms 2.0 these targets were set detailed, partially modified and supplemented by additional points : In contrast to previous approach, reflect only the differences from previous versions in each specification, a complete specification should be written. The vocabulary of HTML must be written as a classic as HTML and XML dialect. Regardless of the form in the vocabulary has a defined Infoset, a DOM can serve the illustration of the source code. In addition to the tasks of the working group, the definition of DOM interfaces for working with the HTML vocabulary and have a separate set with embedded media. The working group is to develop forms and general user input elements such as progress bars or menus and define interfaces for user WYSIWYG editing features. Compatibility : Existing content must continue to be supported. New elements of the language must not adversely affect the existing content. Availability : New functions to solve real problems and this primarily for authors, browser vendors; functions, however, already meet a particular purpose, are not intended to be reinvented. Security : When developing new features safety aspects must be considered. Consistency : Parts of XML, XHTML, should be allowed in HTML. HTML and XHTML have a common DOM figure. Simplification : Through well-defined behavior (even in erroneous situations) and low complexity to HTML can be implemented. Universality : HTML5 should allowed to be used on all handsets and with content in all world languages. Accessibility : The accessibility of content and function should be ensured. This Article Has Been Shared 2711 Times! Session hijack is the method used for hijacking a password protected session to gain unauthorized access in communication between 2 computers including Internet. I would like to take note of this specific blog post, â€œHTML5 Basicsâ€ on my web site. Cite this article as: Abhishek Ghosh, "HTML5 Basics," in The Customize Windows, May 31, 2013, April 24, 2019, https://thecustomizewindows.com/2013/05/html5-basics/.